On board a polar vessel with Captain Haddock at the helm, Tintin and a team of European scientists sail to the Arctic Ocean where an aerolite made of an unknown metal crashed. But soon they find out that another ship is sailing toward the strange meteorite and their expedition turns then into a true race. The first episode to be printed directly in color, The Shooting Star (1942) is based on an event which sees the fall in the Arctic regions of a meteorite which allegedly contains an unknown metal. Tintin and Haddock join the expedition in an attempt to retrieve it. This attempt will turn into a veritable race against the clock involving a team of unscrupulous financiers. Numa Sadoul : "In the Star, the fantastic enters into your work for the first time. There are drawings showing hallucinations and remarkable optical effects. This episode contains something strange: strong dream-like, mysterious, atmospheres..."
Hergé : "Indeed, indeed." The Shooting Star is also the beginning of the four-color printing as well as the establishment of the 62-page format. On the left, a comfortable armchair. In the middle, a wooden coffee table. On the ceiling, a golden color chandelier. Of course, the earthquake makes it looks somewhat untidy. First scientist to appear in Tintin's adventure, the astronomer Professor Phostle would be a completely humorless characters if he didn't' have that taste for bull's-eyes. By the rings of Saturn, one cannot make this up! 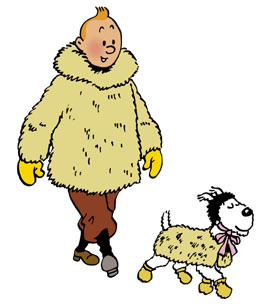 In fact, this is the truth since when Hergé was visiting the Observatory in Brussels looking for documentation, several of its members were real bull's-eyes amateurs. This is with a lot of humor that Hergé treated Captain Haddock's definite tastefor whisky. In The Shooting Star, we find numerous gags based on this unfortunate habit. One of the best shows several cases of whisky being loaded on the Aurora in front of the committee of the Society of Sober Sailors whose Presidentis the Captain himself. Of Swiss origin, Auguste Piccard taught at Brussels University in the '30s and '40s. According to Hergé who would see him on the streets from time to time, the inventor of the bathyscaph was the typical incarnation of the scientist. Before using the peculiar physique of Auguste Piccard to create Professor Calculus, Hergé represented him in The Shooting Star. Look carefully, he is the first one from the right! Hergé was not the kind who would brag about his own drawings. However, he would tell when one of them pleased him particularly. For example, in The Shooting Star, the series representing the Aurora rolling and rocking on heavy seas and the immediate effect it has on the passengers demonstrates the cinematographic talent of Hergé's directing. "It must be magic!" says Tintin. The first time, the apple will almost hit him on the head. The second one will be a hit; he will be knocked out and will almost be engulfed by the raging waves. Hergé enters the world of the fantastic. In 1944 the album was printed twice with a blue back. I have seen pictures of this album both in colour and in black/white. Is it actually true that the album was printed in black and white? You see the problem this would cause? Amazing book! I have had the actual book for years, but I did need some Tintin to read on the go! It's fixed now. You can delete it and download it again (go to settings / your purchases). Secondly there seem to be colour variations between pages, noticeably pages 16, 37, 40 and 50, which seem darker than the surrounding ones. Finally pages 28, 39, 51, 52 and 62 are incomplete. Some of the text is there but the artwork is missing.